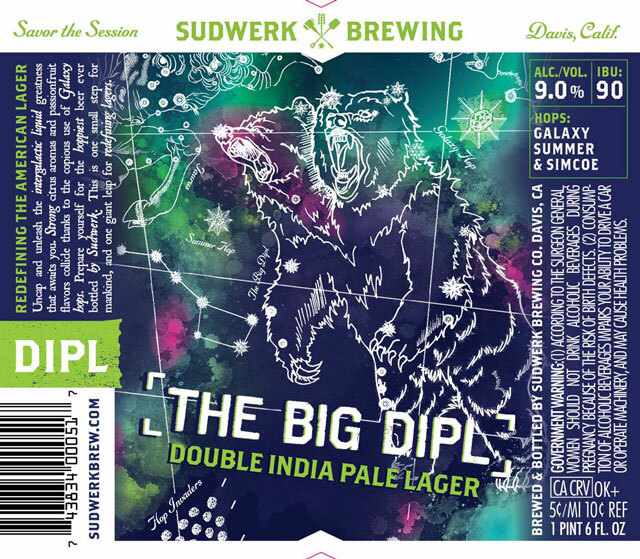 (DAVIS, CA) — Sudwerk Brewing Co. is shooting for the stars with its newest beer, a Double India Pale Lager dubbed THE BIG DIPL. Sudwerk Brewing Co. continues to redefine the American Lager, and this bold brew is a super nova of hop bitterness and aroma. It showcases the coveted Galaxy hops, a hard-to-find variety from New Zealand that combines the tang of grapefruit, melon and passion fruit. IPA fans will enjoy this highly aromatic, intensely flavorful lager, colliding on the palate for the hoppiest beer ever bottled by Sudwerk. Beyond the Galaxy, the UC Davis-trained brewers added Simcoe and Summer hops, topped off with two rounds of dry hopping. It orbits at 9 percent alcohol by volume and 90 IBUs. Because of the higher alcohol content, the taproom will serve it in 13-ounce pours instead of pints. THE BIG DIPL’s label unleashes a double-headed California bear, surrounded by hop invaders. The Big Dipper is part of the Great Bear constellation, Ursa Major. T-shirts featuring the intergalactic lager’s label will be available at the taproom. For details on this and other Sudwerk Brewing Co. events, visit http://sudwerkbrew.com. Building on 25 years of family legacy and brewing tradition, Sudwerk Brewing Co. specializes in artisanal craft brews, specifically West Coast craft lagers. Its taproom, The Dock Store, at 2001 Second St., Davis, Calif., is open from 5 to 8 p.m. Tuesdays, and 4 to 8 p.m. Thursdays through Saturdays. It offers a rotating menu of experimental and innovative beers, “honest pints” and growler fills, fresh White Labs brewers’ yeast, and good conversation.